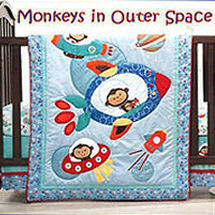 I never knew that there were so many different monkey baby themes that can be used to decorate a nursery until I walked into a boutique one day and told the sales clerk that I needed baby bedding for a monkey themed room. She laughed and asked me which one I was interested in using. Now I'll fill you in on the details and help you locate the best monkey themed nursery bedding for baby’s crib and all the decorations that you need beyond the cutest little monkey of all; your sweet baby. 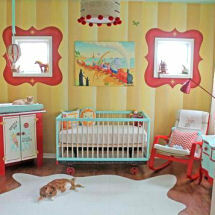 You are going to have so much fun in this room and your baby's going to love it because babies just love monkeys. There's no real need to decorate the baby's room with life sized orangutans and giant gorillas. There are plenty of cute and colorful alternatives that newborns can more easily relate to. In sock monkey decorations alone, there are more than enough items to choose from or you can pick from other precious primates to populate a rainforest theme or to decorate with the bold yellow and red primary colors of the monkey's cap dancing happily around an organ grinder. Our plan is to give you some unique nursery decorating ideas using any kind of monkey baby themes you like. We will show you how to incorporate the educational aspects of this theme and make it whimsical and fun. There will be lots of tips for decorating with the most famous monkey of all; Sock Monkey! You will quickly see that our friend, Sock Monkey, is anything but old-fashioned unless, of course, that's the style that you are looking for. We also have some ideas for decorating a baby girl's pink monkey nursery. Spider monkeys with their wizened little features will work nicely in a jungle themed nursery. Paint a rich, tropical green jungle mural on the nursery walls with lots of exotic animals amongst the foliage. Some monkey stickers on the walls will send the message that it’s a monkey nursery theme rather than a generic rain forest theme. Plush, stuffed life size monkeys are excellent toys for a toddler and in this case; appropriate nursery decorations. There are various cartoon and vintage monkey baby themes like a Curious George nursery theme with Curious George wallpaper and crib bedding or you can pick up a set of sock monkey baby bedding and use your homemade sock monkeys as vintage style decorations. A sock monkey placed in a red wagon in the corner of the room makes an excellent monkey themed decoration as well as active playmates for a toddler. 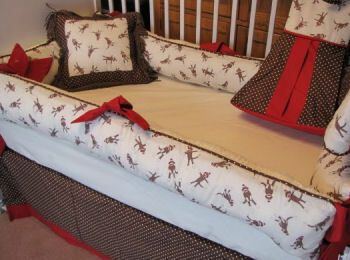 Vintage monkey themes in combination with the right set of monkey baby bedding is an excellent opportunity to bring out that old monkey Jack in the Box for your visitors to admire or to get a pattern or kit and make enough sock monkeys to decorate the nursery as well as entertain your baby. Monkeys are not just for baby boy's nurseries! Animals of any kind are perfect for gender neutral or unisex baby decorating projects, but with proper planning and a complimentary nursery color scheme, monkeys can be made feminine enough for a baby girl's nursery. 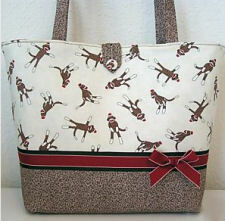 If you’re looking for baby gift ideas for the mom with one of the monkey baby themes we have listed, you are in luck! 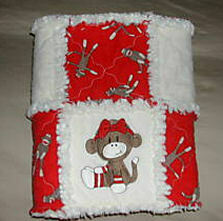 There are lots of decorative monkey themed baby gifts that will delight mom and baby. Make plans to visit again soon to see new monkey baby nursery themes with pictures that show all kinds of creative ways to decorate with them.